SHOOTING THE SHIZNIT : This Saturday Night in Manila, AR - Ron Horner Sr Relay For Life!! 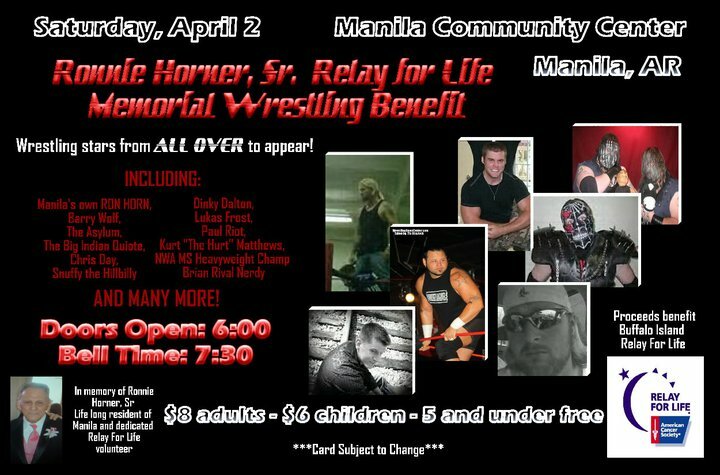 This Saturday Night in Manila, AR - Ron Horner Sr Relay For Life!! ----I wanted to take a moment to put this over to everyone in the area. ----If you are reading RRO and are in the Mississippi/Pemiscot/Dunklin County area, please join RRO for great cause and a fun show this coming Saturday night. RRO Tag Team of the Year 2010 "Asylum" [Pappy/Psycho] will be featured in the main event. Below is poster and the card that was sent to me. This is part of Book Tour 2011 and any Yearbook 2010 that is bought will personally be autographed by the Asylum!! The main event is The South Side Saints vs The Asylum vs Whiskey Hangover (3way tag match) don't know any of the other matches but here's a list of talent: Anton Leveigh, Menace, Brian Rival, Chris Day, Nerdy, Dinky Dalton, The untouchables, Kurt Mathews, Snuffy The hillbilly and many more.